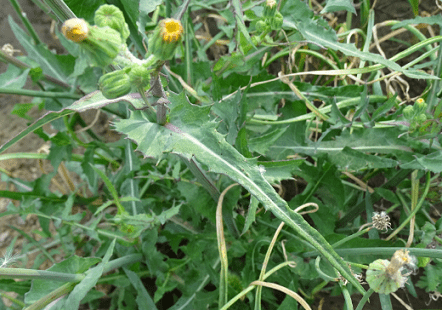 Common Sowthistle (Sonchus oleraceus) complete detail. 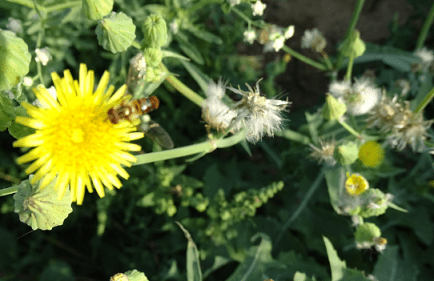 Medicinal uses of Common Sowthistle (Sonchus oleraceus). Description of Common Sowthistle (Sonchus oleraceus). 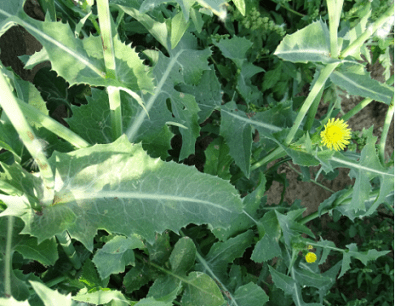 Classification of Common Sowthistle (Sonchus oleraceus). Distribution of Common Sowthistle (Sonchus oleraceus). Local name of Sonchus oleraceus is Common Sowthistle. Sonchus oleraceus is an annual herb, upto 4 ft. in height. The stems are dark green in color (sometimes tinted with a reddish-purple tinge). Flowers are yellow in color, upto 7 mm in diameter. Flowering generally takes place in the spring and summer. The floral bracts at the base of the flower head are dull green, hairless and overlap each other in a vertical series. Cotyledons are egg shaped to narrowly football shaped, hairless, short stalked and upto 3–7 mm long. The seed vessels are crowned with a tuft of hairs, or pappus, like most of this large family of Composite. Bracts are smooth, thin and green. Flowers are are numerous and yellow………. Sonchus oleraceus commonly used as a fodder. It is also used to treat a wide variety of infections. Sonchus oleraceus used in the treatment of headaches, general pain, diarrhea, menstrual problems, fever, hepatitis, salmonella infection, wars, eye problems, liver infections, infections, inflammation and rheumatism. Sonchus oleraceus is an annual herb, upto 4 ft. in height. The stems are dark green in color (sometimes tinted with a reddish-purple tinge). Sonchus oleraceus has hollow stems that exude latex, if damaged. Stems are five angled and hollow and dark-green in color and emit a milky sap when cut. The root system consists of a stout taproot. Sonchus oleraceus has short taproot and deeply lobed leaves. Leaves are lanceolate to oblanceolate in shape, hairless and dark green in color with pale white to purple veins. The first leaves are round with a slightly toothed margin with a few spines. They have sparse hairs on the upper leaf surface. The mature leaves are thin, soft and dark-green in color with irregularly-toothed margins ending in small, soft spines. The upper leaves are smaller than the lower leaves, stalk less and clasp the stems with claw like basal lobes. Leaves are thin and soft, measuring up to 36 cm long and 12 cm wide. Flowers are yellow in color, upto 7 mm in diameter. Flowering generally takes place in the spring and summer. The floral bracts at the base of the flower head are dull green, hairless and overlap each other in a vertical series. Cotyledons are egg shaped to narrowly football shaped, hairless, short stalked and upto 3–7 mm long. The seed vessels are crowned with a tuft of hairs, or pappus, like most of this large family of Composite. Bracts are smooth, thin and green. Flowers are numerous and yellow. Sonchus oleraceus found in Europe, Asia and northern Africa. Sonchus oleraceus is indigenous to Asia and Europe, and it can be found growing in North America, South America, Australia and the Middle East. Sonchus oleraceus also found in Australia, Brazil, Canada, Falkland Islands, French Southern Territories, Greenland, New Zealand, Puerto Rico, Saint Helena, Saint Pierre and Miquelon, United States, Virgin Islands. Sonchus oleraceus commonly used as a fodder. Stems are used as sedative and tonic. Juice of the plant used for cleaning and healing ulcers. 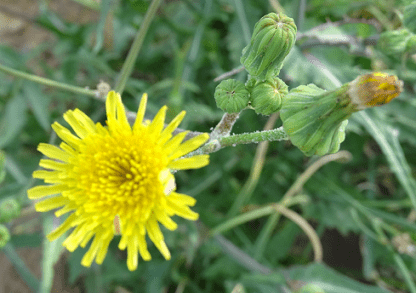 Sonchus oleraceus has many medicinal properties like Antidepressant, Antinociceptive, Anxiolytic, Antioxidant, Antimicrobial, Antitumor, Antimalarial, blood purifier, hepatic, sedative, febrifuge, tonic, Anti-inflammatory, Anticancer etc. Stems and leaves are also used in cooking by local peoples. The latex in the sap is used in the treatment of warts. The leaves are applied as a poultice to inflammatory swellings. Sonchus oleraceus used in the treatment of headaches, general pain, diarrhea, menstrual problems, fever, hepatitis, salmonella infection, wars, eye problems, liver infections, infections, inflammation and rheumatism. It is also used to treat a wide variety of infections.